January 20, 2019 – LA Kelley Communications, Inc. The English royals have always interested Americans, even though we gave them the boot back in 1776. “The Crown” is a popular Netflix show, and the princesses, from Diana to Kate and now Meghan, seem to fascinate us. The hemophilia community is even more fascinated, as the most famous carrier in the world must be Queen Victoria, who up until recently was the longest reigning monarch in English history. Only one of her nine children, Leopold, had hemophilia, and she passed along the gene to two daughters, who later had children with the hemophilia gene, including the famous Alexei Romanov, son of Nicholas II, the last tsar of Russia. The Romanovs and Alexei’s story makes for astounding history, and indeed, may have changed the course of world history (order Alexis: The Prince Who Had Hemophilia to learn more). But who was the last princess? Our researcher nonpareil, Richard Atwood, shares a review about a book on Beatrice, based on the book by Matthew Dennison, The Last Princess: The Devoted Life of Queen Victoria’s Youngest Daughter (2007). Over 18 years of marriage, Queen Victoria had four sons and four daughters, aged four to 17. She delivered her last child, Beatrice Mary Victoria Feodore, on April 14, 1857. For the second time, Dr. John Snow administered chloroform as an anesthesia for the birth. Beatrice was a bright and precocious child. While she began lacking playmates as her older siblings were marrying or leaving the household, Beatrice had her dogs, cats, birds, and ponies as company. 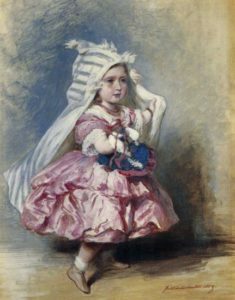 Her father, the Prince Consort, died in 1861 when she was only four. Her mother would grieve as a widow for the next 40 years. By default, Beatrice became her mother’s comforter, companion, and caretaker. Beatrice attended her first grown-up meal in 1863, and regularly sat at the Queen’s dinners beginning at 15. Her older brother, Leopold, was a part-time invalid by 13, often confined to bed, due to his hemophilia. Beatrice herself developed acute rheumatism and lameness by her early twenties. She visited European spas to be treated with massage and healing water, plus, later in life, took trips to the warmer Mediterranean. She also had neuritis in her hand, right arm, knee, and foot. Her sister, Princess Alice, who was in poor health due to rheumatism, neuralgia, tiredness, and headache, died of diphtheria in 1878 when only 35. John Brown, the Queen’s companion, died in 1883 after 19 years of service. Leopold died in 1884. 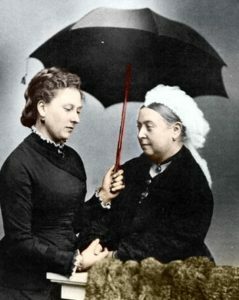 Queen Victoria ended any potential romance between Beatrice and Louis of Battenberg, but allowed the marriage of Beatrice to Henry of Battenberg, called Liko, in 1885, provided that Henry give up his independence, military career, German nationality, plus live with Beatrice and the Queen. Beatrice replaced her sisters, and Liko replaced Leopold, to serve Queen Victoria. Beatrice was the shyest of the 9 siblings, and also the most devoted of the daughters. She had a retiring and unassertive manner, was uncomplaining, and had a habit of avoiding eye contact. 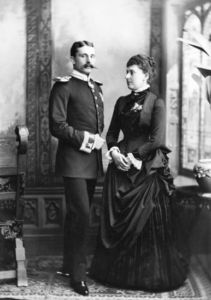 Beatrice was radiantly happy with Liko, and, following a miscarriage in 1885, had three sons and a daughter: Alexander, Victoria Eugenie (“Ena”), Leopold, and Maurice. Leopold (1889-1922) had hemophilia. The birth of Ena, a hemophilia carrier, was assisted by forceps and occurred at Balmoral, the first royal birth in Scotland in 300 years. In 1896, Liko volunteered for the Ashanti Expedition in West Africa and died of malaria. Queen Victoria died in 1901. Beatrice, as literary executor, would edit and rewrite the 111 volumes of Queen Victoria’s journal over the next 30 years. Ena, thought not fluent in Spanish, married Alfonso XIII of Spain in 1906, and converted to Catholicism. Her firstborn and male heir, Alfonso, had hemophilia. Three of Beatrice’s sons served in the military during the Great War. Maurice died in 1914 at Ypres. Leopold died in 1922 following an emergency operation complicated by his hemophilia. Beatrice suffered from rheumatism and bronchitis, unable to walk and breathe. She died an invalid and a widow of 48 years in 1944, the last princess, at 87 years. Hemophilia is no longer in the English royal family, which is why you don’t hear about it anymore as the “royal disease.” The heirs of Beatrice and Alice who carried or had hemophilia are all gone.